Blackheath Village Hall is a welcoming and unique building. Designed by the ‘Arts and Crafts’ architect Charles Harrison Townsend it was completed for Queen Victoria’s Diamond Jubilee in 1897. 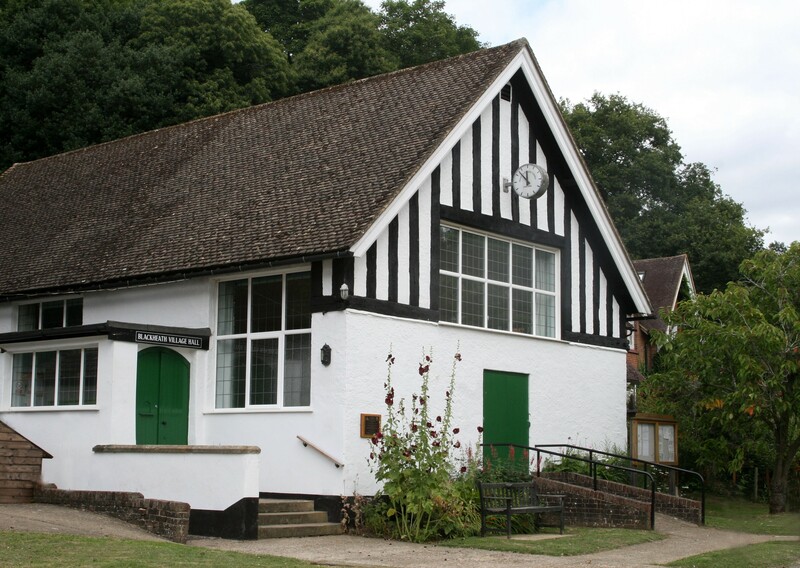 Full of great character and charm, the hall is still today a highly valued facility for use and enjoyment of the village residents and the wider community. Situated at the western end of the village with woods at the rear it is a building that sits proudly in the heart of the village. Internally it is spacious, light and airy, comprising of a front entrance lobby, main hall (about 15.5m. x 7.8m.) stage, kitchen with cooker, dishwasher and large warming cupboard and ladies' and gent’s toilets. There is an excellent selection of various sized tables and elegant padded chairs that lend the hall to being prepared and decorated to suit most occasions as well as being a good base for clubs and activities. There is central heating and a hot water system, and the thick walls plus added insulation ensure that the Hall is warm in winter and cool in summer. The main hall décor is pleasant and the lighting can be dimmed. The hall is licensed to accommodate a maximum of 120 persons..
Booking enquiries can be made to the Letting Secretary - Jane Hayward on 01483 898365.